There are hundreds of variations of granola bars, and probably as many recipes as there are people making them because each person tweaks the basic recipe to suit their tastes, health requirements, and what they have readily available. After all in survival situations it’s all about using that is right there in your store cupboard, in your garden or from your survival farm. Why granola bars for emergencies? They’re small enough to tuck a couple into your survival vest or pants and provide enough energy to see you through a day on the go. Moms love them as you can stash them in children’s back-backs so when they are hungry after sport at school, or can’t get home on time they can tuck into one. Of course, with kids at home you may have to hide the survival stash otherwise every day may become an emergency – according to the kids – requiring one or two bars to ‘keep me alive’. Flaxseed – one tablespoon contains 3 grams of fiber and 2 grams of protein. It is also rich in alpha-linolenic acid – a type of omega-3 fatty acid, and contains lignans, which studies have shown may protect the body from cancer. Flaxseed is also good for cardiovascular health. 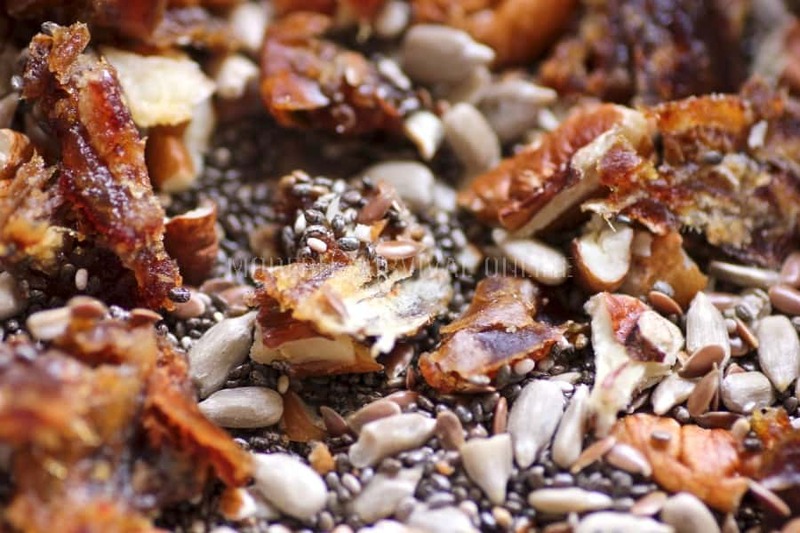 Sesame – these seeds are high in copper, and provide 162 calories per ounce as well as being high in dietary fiber. 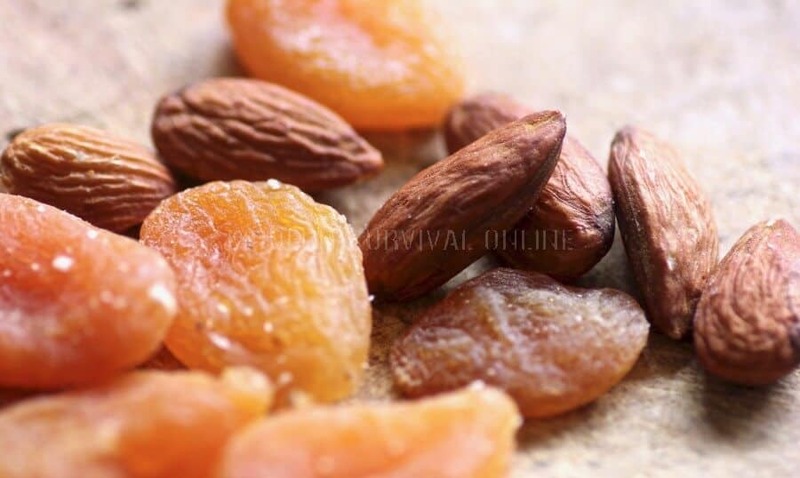 They are also have plenty of manganese, calcium, phosphorus, magnesium, iron, zinc, molybdenum, vitamin B1, and selenium – all the vitamin and minerals you need in survival situations. Sunflower – these seeds are also a source of copper, vitamin B1 and vitamin E. They are also rich in manganese, selenium, phosphorus, magnesium, vitamin B6, folate and niacin and provide 166 calories per ounce. Chia – per ounce these tiny little unprocessed seeds have been shown to contain 11 grams of fiber, 12 grams of carbohydrates, 4 grams of protein, 9 grams of fat, plus various vitamins and minerals, providing 139 calories. Pumpkin – Three and a half ounces of pumpkin seeds contain around 50% of a person’s daily protein requirement, and provide about 560 calories so you won’t be hungry with some of these in your granola bar. The seeds provide us with zinc, magnesium, manganese, copper, antioxidants and phytosterols that help reduce blood cholesterol levels. This granola bar mix contains pecans, chia seed, sunflower seed, cranberries and dates – the oats and coconut will soon be incorporated together with the sugar, honey, and coconut oil. Almonds – one ounce of almonds has 6 grams of protein, 4 grams of fiber and significant amounts of vitamin E, as well as magnesium, calcium, potassium and riboflavin and provides 163 calories. Cashews – like all nuts these run high to fat – almost 50%, and are particularly rich in vitamin E, magnesium and zinc and other minerals, providing 161 calories per one ounce serving. Hazelnuts – again these are loaded with nutrients, fiber, minerals, and vitamins, with one ounce supplying 176 calories. Pecans – one ounce of pecans provides a whopping 196 calories, 2.7 grams of fiber and are high in fat, as well as providing 19 different minerals and vitamins essential to health. Walnuts – at 183 calories per ounce walnuts are rich in protein, fiber and fats but what makes them important is that they have been associated with improved cognitive performance in adults, something very useful in a survival situation when clear thinking is critical to successful outcomes. Pistachios – originating in the middle east these nuts provide plenty of fiber and protein as well as vitamin B6 and vitamin E, copper, magnesium, manganese, phosphorus, potassium, and anti-oxidants. They contain the least calories per ounce of the nuts on this list at 159 calories. Granola bars are healthy as a quick pick me up but make no mistake, they are loaded with calories. Toast the oats, coconut, and nuts in the oven – spread them out on a dry baking sheet and watch them carefully as you don’t want them to burn – about 10 minutes should do it. Put your other seeds and fruit into a bowl then add the toasted nuts and oats. You can add spices like cinnamon or pumpkin pie spice at this stage and a little salt. Heat coconut oil, sugar, honey, butter, nut butter, or condensed milk and mix in to coat evenly. Line a pan with parchment and press the mixture down firmly. Place another layer of parchment paper on top and using a glass jar or something similar press down further so the bars stay together when cooked or after placing in the freezer for a while if you are doing no bake bars. Bake at 325 degrees for around 20 minutes for chewy bars and around 30 minutes for more crunchy ones. Make sure they are cool before cutting, and make sure you use a sharp knife. If you skimp on ingredients and add more oats and coconut the bars are unlikely to stick together – for the “glue” you need to cut the dates up fine or process them into a paste, and use the sugar butter mix or condensed milk as these moist ingredients help hold the bars together. Many people like to add chocolate chips to the bars and this should be done just before baking so the chocolate doesn’t melt into the ingredients when you add the hot butter/sugar mix. White chocolate, milk chocolate, dark chocolate or caramel chips are all going to be a yummy addition. Granola bars are high in fiber and because they take longer to digest they keep you feeling full for longer. In emergency situations you probably will be doing a lot more physical work than you usually do – whether it is getting your family and pets out of a dangerous situation, doing all your own chores manually because appliances don’t work if there is no electricity, carting water, getting involved in clean up operations, rescuing furniture and household items of your own or your neighbors and even digging through rubble in order to rescue people. Oats has fiber and iron, nuts and seeds have heart healthy unsaturated fats and protein BUT they can be high in calories. Consider the concentrated sugar in dried fruit – the moisture has been dried out of it but the sugar content stays the same even through its around 1/5 of the size – think of raisins – shriveled up grapes, and how sweet grapes can be. Then think bout the sugar added to make the bar stick together plus the dairy butter or nut butters. You are going to be using a lot more calories than you usually do in a day. This is where sugar can give a boost. Now there are people who believe sugar is the devil and in large quantities it certainly is, but if you are going to burn off that sugar with hard work then it is fine. The nuts in the bars provide enough protein, dates provide substance – Arabs crossing the desert can survive on a handful of dates a day (until they reach an oasis where they can tuck into a lamb tagine), the oats provide fiber and you have the energy-giving sweetness of the dates, sugar, coconut and honey. Some people prefer to use honey rather than sugar, as it is healthier, but honey gives a chewier granola bar rather than the crisper one you get from using sugar, however if you are concerned about health then honey should not be heated. In Ayurvedic medicine it is believed that honey heated over 140 degrees C creates ‘ama’ or inflammation and toxicity in the body. If your honey has been heated to ‘kill organisms’ it is basically dead honey, which you shouldn’t even bother eating because it does nothing for you. Having said that heated honey does undergo a chemical change that makes it act like a glue holding your bars together, as does sugar. So if you are making unbaked granola bars use the unheated honey for flavor and use the heated cane sugar to hold your bars together. Making non-baked granola bars is useful if you are low on power. Personally I find the baked ones to be firmer and less likely to dissolve into clumps of granola. For both types you need the melted brown sugar with the melted, butter or nut butter to create a sticky liquid that will hold the bar together – otherwise you may as well just take some granola flakes/clusters, and put them in a container to snack on in an emergency. Personally I prefer to stay away from peanut butter, because peanuts contain lectins, which can damage the lining of the intestines, and the FDA lists an allergy to peanuts near the top of their Common Food Allergens list. Some people use peanuts and peanut butter in their granola bars and that’s fine if your family does not have allergies, but there are other nuts butters like almond or pecan that are way better for you. Also, peanuts are susceptible to mold that produces mycotoxins – one of which is called aflatoxin, and is a known carcinogen. The mold can also grow on corn and tree nuts but peanuts seems susceptible as they grow under the ground and this is a soil-borne mold. Check the nuts you’re going to use carefully for any sign of mold and roast the nuts before putting them in the granola bars. Apart from avoiding a health issue by heating them your kitchen will smell divine with the nuts, coconut and oats toasting in the over! If you have the luxury of vacuum sealing your bars then do this by all means, otherwise wrap individually and securely and then store in an airtight container. Make sure you packaging is secure – you don’t want a pocket full of disintegrated granola bar after a day of hiking! Now, there are some people claiming they have kept granola bars for years, but if we think about it carefully emergency situations can last anything from a couple of days to maybe a month or more – especially when disasters like hurricanes hit. So seriously why would one want to keep them for years? Rather use and replenish stocks so you always have enough fresh bars in an emergency. Remember, if you live in a fairly humid area the bars won’t last as long as areas where there is low humidity. No one wants to risk an emergency situation where the long-stashed granola bars turn out to have rancid nuts or moldy dried fruit. 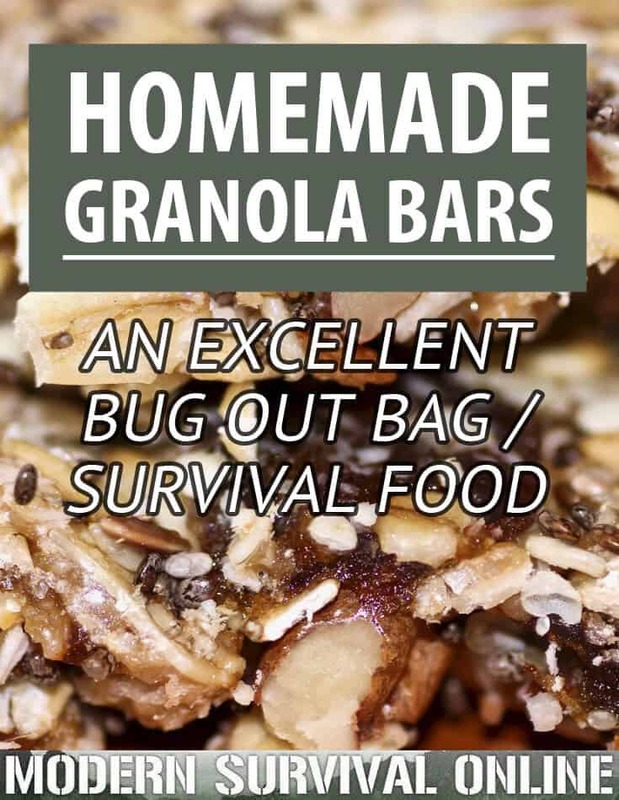 Some people keep their bars frozen so they will last much longer and can be taken out in an emergency, however granola bars do not need to be refrigerated – another bonus in a bug out situation. As long as they kept in a cool dark place away from direct sunlight, and protected from air they will last for around six months or more. 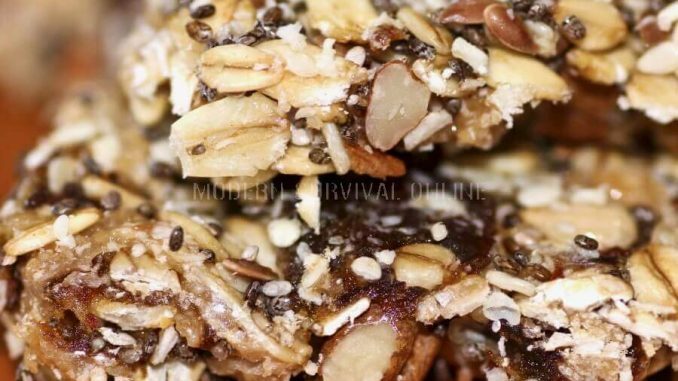 If you don’t do this they will lose their texture and flavor, and since granola bar ingredients are somewhat costly, you won’t want to waste any of those nuts, dried fruit, or chocolate. You’ll rather want to enjoy them around a campfire with a hot mug of coffee.